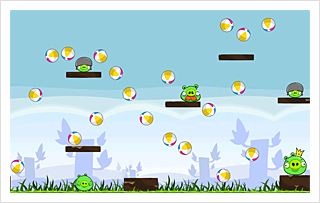 Angry Birds maker Rovio will begin using predictive analytics technology from the Seattle-based company Medio to help improve game play for its popular pig-smashing game. According to the press release announcing the partnership, Angry Birds has been downloaded more 300 million times and is on course to reach 1 billion downloads. But it isn’t merely downloaded a lot; it’s played a lot, too. The game, which sees up to 1.4 billion minutes of game play per week, generates an incredible amount of data: user demographics, location, and device information are just a few of the data points. Users’ data has always been important in gaming, as game developers must refine their games to maximize the amount of time players spend as well as track their willingness to spend money on extras or to click on related ads. As casual gaming becomes a bigger and more competitive industry, game makers like Rovio will rely on analytics to keep their customers engaged. The extensive engagement of our players provides over 15 terabytes of game data per day that we use to enhance our games by designing, testing and releasing new features on an ongoing basis. We believe that combining data analytics with creative game design enables us to create a superior player experience. By enlisting the help of Medio for predictive analytics, it’s clear that Rovio is taking that same tactic to improve the Angry Bird experience. HP made a number of big announcements last week as it revealed plans for an overhaul. These plans include ending production of its tablet and smartphones, putting the development of WebOS on hold, and spending some $10 billion to acquire the British enterprise software company Autonomy. As MIT Technology Review’s Tom Simonite puts it, HP wants Autonomy for its “math skills” and the acquisition will position HP to take advantage of the big data trend. After several months of invitation-only testing, the web got its own official daily newspaper this week with the launch of The Daily Dot. CEO Nick White and founding editor Owen Thomas said the publication will focus on the news from various online communities and social networks. and assistance from Ravel Data.